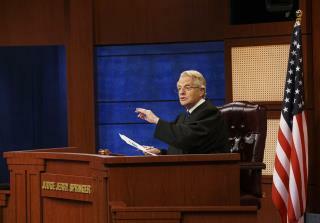 (Newser) – Meet Judge Jerry—Judge Jerry Springer. Yes, the former daytime talk show host has a law degree, and he'll be putting it to good use back in daytime syndication. Springer is returning to the small screen for Judge Jerry, a daily, first-run half-hour court program debuting in national syndication in the fall of next year, Deadline reports. "For the first time in my life, I am going to be called honorable," says Springer, who got his J.D. degree from Northwestern University. "My career is coming full circle and I finally get to put my law degree to use after all these years." Springer, who is reteaming with NBCUniversal TV Distribution for the show, worked for two law firms before getting into politics (he was also mayor of Cincinnati) and then TV. With Judge Judy raking in the cash Springer comes in to clean up the scraps What a joke !! Trump's latest effort to discredit the American judicial branch. Follow the money.